I just stumbled upon what is, possibly, the most intuitive piece of software yet: Delicious Library. It's Mac-only right now, so sorry Windows-only users. The concept is not a new one - create a catalog of your book/CD/DVD/Video Game content. People have been doing this in Excel for years. While one visible improvement on this is the shelf view, a "3D" view of your content, the real revolution comes with the way items can be catalogued. I was able to catalog my entire DVD collection (including HD-DVDs) while we were printing our Christmas Card mailing labels. Partly, this is because it was so difficult to print mailing labels under Vista. 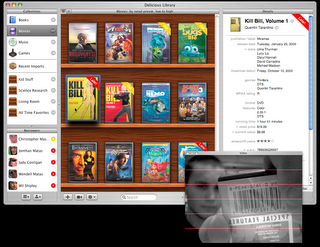 Partly, this was because of the input mechanism: I enabled the iSight camera on my MacBook Pro and just scanned the bar codes on the DVDs themselves. The software then goes off to Amazon and grabs relevant info about the product based on its UPC code. I had to make minor tweaks, but only minor tweaks.